Consumers often forget about their insurance when making their own travel arrangements. It will be too late to arrange travel insurance once you have left the home country. Different rules will apply if the traveller is hiring a car midway in the holiday or business trip for example, but if you are collecting a car upon arrival at your destination you can save a lot of money by buying your excess waiver insurance in advance rather than at the car hire company’s reception desk. The excess waiver insurance means that when there is a claim for damage, the renter does not have to pay the excess on the car hire vehicle’s insurance which can often be a fair amount of money. When the renter takes out the additional excess waiver insurance via the car hire company, they will usually pay a lot more per day than they would if they bought the insurance from an independent company. jml Insurance and insurance4carrental.com promote a small selection of these specialist car hire insurance companies. These brand names include Questor Insurance Services, insurance4carhire, carhireexcess, Worldwideinsure, iCarhireinsurance and Protectyourbubble. All of them offer daily and annual policies. All of them very good value. Questor and Worldwideinsure also offer motorhome hire excess insurance which is really good for those taking a “mobile self-catering holiday”. For those renting a van or minibus, Questor also offers van hire excess and minibus hire excess insurance products. iCarhireinsurance and insurance4carhire via their brand name insuremyvanhire offer van hire insurance as well. 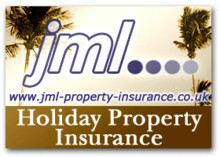 Apart from motor vehicle hire excess insurance, jml insurance promotes other selected products for the holiday maker. Travel insurance with a small selection of brands offering travel, financial failure and excess insurance. Anyone buying Questor Insurance products through links at a jml insurance site – Car, van, minibus, motorhome excess waiver insurance/Travel insurance/Motor excess insurance/Car club excess insurance/Gadget insurance - can get a 10 per cent discount. The holiday homeowner is not forgotten, with overseas products from Intasure and Copeland International and UK products from these companies plus Rentguard Insurance. Some of these companies will also provide main residence insurance in the UK and overseas as well. Summertime is when people are busy “messing about on the water”. Whether it is on the river or out at sea the right boating insurance is essential and Noblemarine Insurance and Quotezone are the companies to contact. At jml-insurance the consumer makes all arrangements direct with the individual insurance company they are dealing with. Consumers in Ireland have their own website – Irish Property Insurance.com – this provides a range of Blue Insurance products – Car hire excess, travel, pet, wedding, gadget insurance Plus Intasure and Copeland International property insurance, rental insurance and other Travel insurance products.